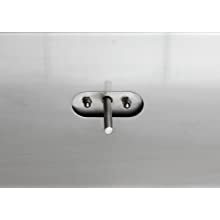 This Bull grill is constructed from durable 16 gauge 304 stainless steel which is one of the highest grades of stainless steel and one of the thickest used in the grill industry. Using this high quality material makes the grill both sturdy and highly resistant to rust and corrosion. 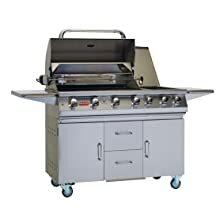 The hood of this Bull grill is dual lined with single piece construction. Single piece construction means no unsightly seams or screws that can also become points of structural failure. 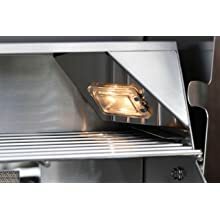 The dual lined hood helps trap heat inside the grill head and also keeps the outside surface cooler to the touch. High temperatures can also discolor stainless steel over time so keeping the external surface away from exposure to direct heat ensures the grill will stay beautiful for years. 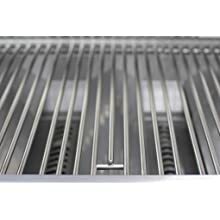 The Bull cooking grates are solid 304 stainless steel all the way through. Solid 304 stainless steel construction, as opposed to hollow, transfers heat better for more consistent cooking and will last a lifetime. Piezo Igniters are simple, independent ignition systems that are designed with the least amount of wiring to directly ignite each burner. 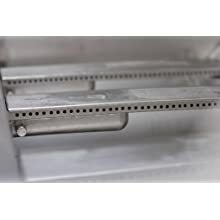 Each Piezo Igniter is protected by a stainless steel housing so food drippings do not interfere with the spark igniting the gas from the burner. What separates a gourmet grill from a standard grill is versatility and the rotisserie/back burner combination on the Bull 7 Burner Premium Grill provides serious grillers the ability to slow cook any type of meat. 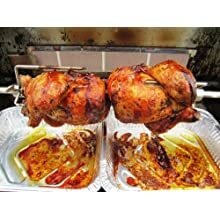 The rotisserie is comprised of a chrome plated spit and rod plus a stainless steel motor housing. 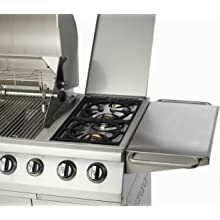 The Bull 7 Burner Premium Grill features one of the most durable burner designs available. Bull pours the stainless steel into a mold to make the solid cast stainless steel burners. This provides absolutely dependable and long lasting performance backed by a 20 year warranty. The Bull 7 Burner Premium Grill comes complete with double side burners allowing for an even greater variety of grill uses. With Piezo igniters and 15,000 BTU's each, this feature is perfect for gourmet grillers looking for extra versatility in a grill cart. Even grilling in a well-lit area can leave shadows on the grilling surface caused by your body or the grill structure. 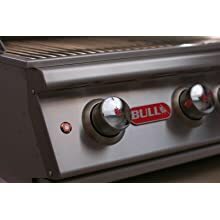 The Bull 7 Burner Premium Grill solves that problem by including two lights, one in each upper corner, for complete visibility leading to better, more accurate cooking.